I believe Producer rank/unlocking songs is dependent on number of total fans for all the idols combine. You usually see this number at the end of the day when the game adds in your fans. It's been awhile, but I think it's around 25 million fans to unlock all the songs. 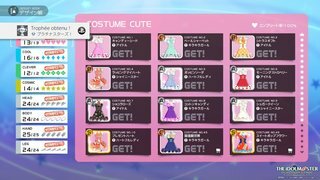 Fastest way is to do those one time DL lives (not the ones that give you acessories/costume) which give you a ton of fans. Probably already known, but I'll say it anyways. Once you have at least 5 hearts, the last memory appeal will occur after the burst sequence. If you have at least 8 hearts, then the last 2 memory appeals will occur after the burst. However, if you have 6 or 7 hearts, then you'll still only get 1 memory appeal after the burst. You are off a 0 there unfortunately. It's 45k for 1 promotion yielding 110k fans (with a 10% fan bonus), so getting from A to S rank is almost 3.7 million. But yeah, you almost need to make use of that. Personally i farmed the RE:whatever quintet live, it gives a lot of fans and also a lot of money. The costume you get from the solo live after getting Iori to S rank is perfect for farming that live btw, since the image and type match, and it has a 30% money bonus, so the live yields over 19k. I got myself a ps4 today, can finally play PS. After some point i simply played one season per day, which takes about 1 hour. You make still good progress that way, without burning yourself out too much.